I suspected that this Pope is a ho ho ho for young naked men but now we have the proof . . . still photos and a video. This is a real photo and real video of the slow seductive strip tease, leading up to the big climax for the Pope and his beautiful male “secretary. 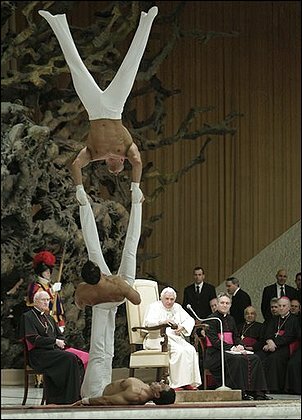 Watch as four Chippendale-like acrobats perform in front of Pope Benedict XVI and his personal secretary Georg Gaenswein (seated beside the Pope at the right side of the photo), during the Pope’s weekly general audience in the Paul VI hall at the Vatican, Wednesday, Dec. 15, 2010.